What are the closest frequencies to 500 Hz that an average person can clearly distinguish as being different in frequency from 500 Hz? The sounds are not present simultaneously. This is College Physics Answers with Shaun Dychko. The smallest change in frequency that a person can usually perceive is 0.3 percent. 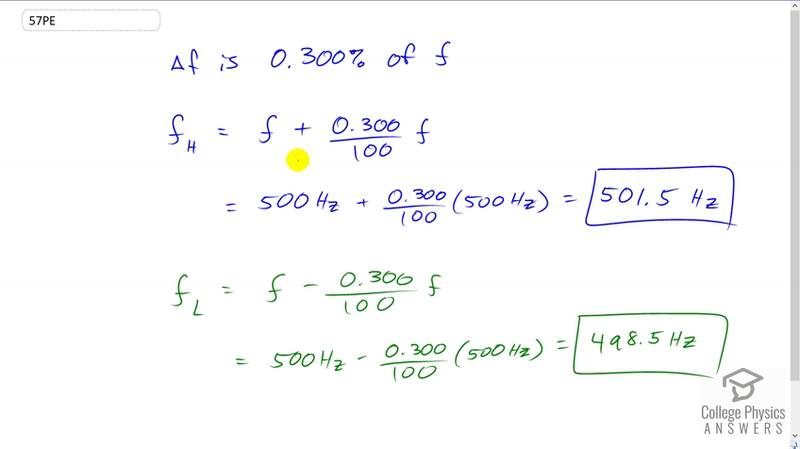 So we are going to add 0.3 percent to this given frequency f and find the high-end or the upper frequency that is detectible and then we will subtract the three percent f away from f. And find the lower frequency that would be audible. And so we have the original frequency of 500 Hertz plus 0.3 over hundred that turn this 0.3 percent into a decimal times 500 Hertz. This gives 501 and a half Hertz. And then the first lower frequency that would be audible is going to be 500 hertz minus three percent which gives 498.5 Hertz.